I read somewhere that one of the most calorie-laden beverages at Starbucks is the white chocolate mocha. Naturally, it's one of my favorite drinks there. I'm the kind of person who would rather eat her calories than drink them, so that smooth, rich, luscious drink was the inspiration for my latest cake creation. Here's my end result: The base consists of thinnish layers of soft, fluffy chocolate cake moistened and enriched with a Kahlua-flavored simple syrup. This was tasty on its own, but it was made even more decadent with the addition of a velvety white chocolate mousse between each layer. This was so easy to make, it almost seems unfair that it was so incredible to eat. To finish things off, I brought back my current favorite frosting, a coffee-tinged cream cheese pile of heaven. To prepare the simple syrup, combine the water and sugar in a saucepan and stir over medium heat until the sugar is dissolved. Bring it to a boil, then remove it from the heat. When cool, stir in the Kahlua. To prepare the mousse, carefully melt the white chocolate and set it aside. Place the heavy cream and sugar in the well-chilled bowl of an electric mixer fitted with the chilled whisk attachment. Whisk on high-speed until stiff peaks form. Remove the bowl from the mixer. By hand, whisk to combine 1/4 of the whipped cream into the melted white chocolate until smooth and completely incorporated. Add the combined whipped cream and chocolate to the remaining whipped cream and use a rubber spatula to fold together. Prepare the frosting and set it aside. To assemble, liberally brush the four sides of exposed cake with the simple syrup. Slather the mousse between the halved and syruped layers (stacking as you go), then frost the sides and top in a decorative fashion. Chill for a bit to let things mingle, then slice and serve! That cake is beautiful! Mmmhhh, a marvelous calorie-laden treat. My husband and I love S'bucks too and I agree about not drinking your calories so I usually try to stick with an Americano or even just their drip coffee. I figure if I don't try all of their fun/sweet drinks I just won't know how good they are. So this cake looks and sounds absolutely amazing! Your layers look incredibly moist and all of the different fillings and frostings sound like they would be wonderful together. The White chocolate Mousse I could just eat by itself. I would make this with a black magic cake because you put coffee in the batter. My husband's b'day is coming up so I think this cake sounds like it would be a great one to make him. I too have a strict rule about not drinking my calories...eating them in the form of cake is another matter, though. This looks amazing, as all of your creations do. I especially love the sound of the white chocolate mousse, and the contrast of the white and dark is really beautiful. Totally with you on that one. I'll take solid cake over liquid cake anytime. Especially, if there is coffee somehow involved. Wow, this looks super yummy.....I really need to try this! I love the Chai Latte's at Starbucks, but any ca,orie laden drink from there will do:D As for this cake pass me a huge slice please. Yikes, that is one beautiful cake! Drive through and calorie free would be excellent! I can feel myself putting on weight just looking at that magic creation! Calorie schmalorie = best blog post title EVER! I love this cake idea! I may make it for my mom because that's her favorite drink. For a friend's birthday, I took her favorite coffee drink from a local coffee shop and turned it into a cake: chocolate cake, chocolate mocha ganache buttercream frosting filling, and caramal icing cover. I think you can never go wrong making a great coffee drink into a cake, it always works out wonderful! Who cares about calories when it looks this good! First, white chocolate anything, and I'm on board. But, white chocolate mocha in food form? Heaven! Just give me a fork! It's a known fact that desserts do not have calories. Didn't you know? I love white chocolate in any form and this looks amazing! I went to a S'bucks once and ordered a plain hot tea. The clerk was very confused, even when I said, "No calories. Lots of caffeine. Very big." The manager had to figure out how to put 2 tea bags and hot water in a quart sized cup. I'll eat my calories in the form of this cake any day. I'd like a slice with a grande white chocolate mocha to go please! ahhhhh, melt in your mouth and straight to your bottom goodness. #SoWorthIt! that is one drop dead gorgeous cake...hello mousse filling and cream cheese frosting, I'd gladly bypass starbucks obesity inducing shakes for you! Thank heaven I don't drink coffee so all my calories can come from this divine cake. OMG. Oh Grace. You are a girl after my own heart. Who pays upwarfds of 3 quid for a coffee and worries about calories?! This looks spectacular. Definitely one to make for the coffee fiend husband! Wow I bet this is amazing. I so want a bite of that. Where was this cake on my birthday? I will have to remember it for next year. Good grief, that is one stunning and fabulous-sounding cake. Nice job, Grace. YOu have definitely given Starbucks a little competition! Grace, this cake looks yummie from all perspectives...love the Kahlua liquor and the various layers of cake and mousse...ending with the cream cheese frosting. Sometimes calories do you good! The cake looks phenomenal! I'm with you, Grace -- I'd rather eat my calories than drink them too! The cake looks great...wish I had a fork and a big slice right now! I'm a fan of their eggnog lattes...which I know are just full of fat. I can't help it. They are so good! Gorgeous cake, love those beautiful layers!! This is soooo very tempting right now! I normally find the more calories something has the tastier it is. This is one nice looking cake, can't wait to try it! With the onset of pumpkin spice latte season as Sbux, I'm having a particularly hard time keeping myself from drinking a lot of calories. Maybe a slice of cake would make it better? This is EXACTLY what I need! Pass a fork! I don't drink my calories either...well except for wine, lots of wine...haha! That cake looks fantastic and has all my favorite flavors! White chocolate mochas are MY favorite as well! But I'd much rather have them in cake form. you done good. Just mouthwatering...looks so easy to prepare and delicious. Exquisito y bello te ha quedado de maravilla,luce espectacular,abrazos grandes. OMG..how amazing is this cake, simply divine Grace. Drooling! Wish I had a slice right now! I agree- eating calories is so much better than drinking them ;) I'd choose this cake over a Starbuck's drink any day! 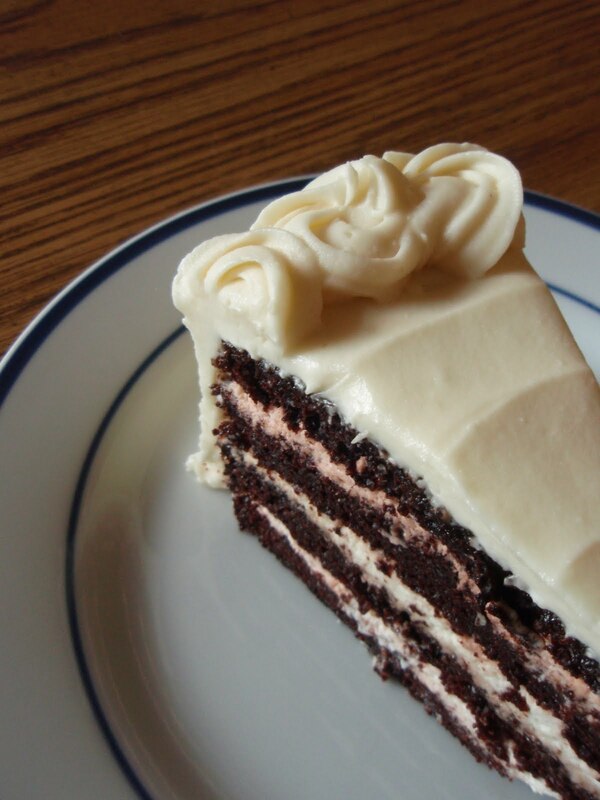 ;) It looks incredibly decadent- you make the most scrumptious looking cakes! I really want to whip one up right now! SBUX needs to hire you. Their stuff is nothing compared to your good digs! Yum! Ooooh dear Grace,what a beautiful stylish & elegantly looking piece of a special cake! What a lot of work though, but so worth it! Wow! This looks awesome. It would be great with cherries. Oh my goodness, this sounds so awesome. I had a dessert recently that incorporated white chocolate mousse, and it was divine. Definitely going to give this a try. such a beautiful looking cake! Oh man! This cake is gorgeous. Whoa... That is one tempting slice of cake there, miss Grace! A Kahlua syrup? Coffee cream cheese frosting? Chocolate cake???? This is the cake of my dreams. Love the Kahlau touch! wow i want a slice now! Made this for Christmas and it was a huge hit. Now my adult daughter has requested I make it for her birthday. Thanks for this great recipe.